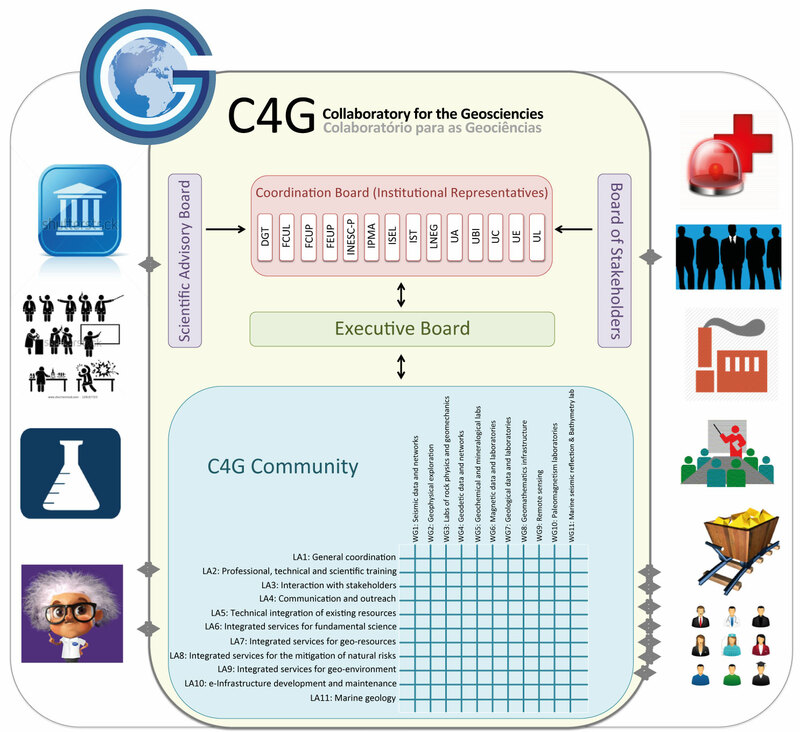 C4G multi-institutional and multi-disciplinary nature requires bodies with different assignments, which validate each other and collaborate towards the same goals. C4G bodies are purposely diverse, encompassing both senior accomplished specialists and young dynamic researchers, scientists and technicians, as well as professionals experienced in the management of RIs (laboratories, networks, data centers, etc). C4G decision-making body is the Coordination Board, where every institution is represented. The Executive Board is the management team responsible for the daily running of C4G. C4G counts with two external advisory boards: one scientific, composed of 3 members internationally recognized for their work on SES, and one service-oriented, with representatives from the stakeholders. The integrating mission of C4G relies on a structure with vertical disciplinary working groups (WGs) and transversal lines of action (LAs). WGs aim at networking and integrating RIs inside the scientific disciplines of C4G. Transversal LAs have two goals: 1) to promote a healthy interaction of C4G with society, and 2) to address themes of scientific and societal relevance that cross cut all C4G disciplines. The team of LA leaders writes an annual scientific report, which is supplemented by a financial report written by the Administration and Financial Director. The annual report is presented to the external advisory boards, which give feedback to C4G. The action plan of C4G must hinge on three major tasks: 1) to integrate across disciplines and institutions, 2) to create a culture of service providing, and 3) to build a prosperous relation between C4G and its stakeholders. To this end, the C4G community will be structured by two sets of perpendicular pillars: a vertical structure, by disciplines (WGs) and a horizontal structure, transversal to all disciplines (LAs). This structure safeguards: 1) the specialized expertise inside disciplines that is required to push the boundaries of knowledge, and 2) the integrated multi-disciplinary vision that is required to tackle complex solid Earth problems.